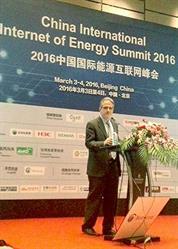 REDWOOD CITY, CA--(Marketwired - March 08, 2016) - C3 IoT™ president and CTO, Ed Abbo, gave the opening keynote address at the China International Internet of Energy Summit 2016 conference in Beijing on March 3, 2016. Abbo explained that the industrial Internet of Things is rapidly emerging as a strategic competitive advantage that delivers significant economic value, and shared use cases of large, global corporations deployed at scale on the C3 IoT Platform™. The event also showcased C3 IoT's partnership with DHC Software, one of Asia's best companies under a billion, according to Forbes,1 during a standing room-only session. Together, the companies will leverage C3 IoT's proven, elastic cloud, big data analytics, and machine learning-based IoT applications to advance the efficiency and resiliency of China's power grid from generation, transmission, and distribution, through to energy consumption and the expansion of renewable power. DHC Software and C3 IoT will facilitate the deployment of applications that support predictive decision making, optimize operational efficiency, minimize industrial risks, and provide enormous economic and social benefit through the integration, processing, and analysis of data. "It's an honor for the DHC Software Company to partner with C3 IoT in developing the Internet of Energy in China," said Mr. Xue Xiangdong, Chairman, DHC Software Company. "Today our companies are providing big data analytics for China's power industry with the C3 IoT Platform and tools. In the future, our cooperation will extend to additional industries, including energy production, smart cities, smart healthcare, telecommunications, and more. This is an important time in China's digital transformation." C3 IoT recently expanded the application of its C3 IoT Platform to provide a full-stack IoT development platform to address the requirements of enterprise markets, including oil and gas, manufacturing, aerospace, automotive, chemical, pharmaceutical, telecom, retail, insurance, and financial services companies, as well as public sector organizations. C3 IoT provides a full-stack IoT development platform (PaaS) that enables the rapid design, development, and deployment of even the largest-scale enterprise applications that leverage big data, telemetry, elastic cloud computing, analytics, machine learning, and social human computer interaction models. C3 IoT also provides a family of turn-key SaaS IoT applications including predictive maintenance, fraud detection, sensor network health, supply chain optimization, investment planning, and customer engagement. More information is at http://C3IoT.com. 1 Forbes, "Asia's 200 Best Under a Billion," June 2015 (http://www.forbes.com/companies/dhc-software/). C3 IoT President and CTO Ed Abbo.